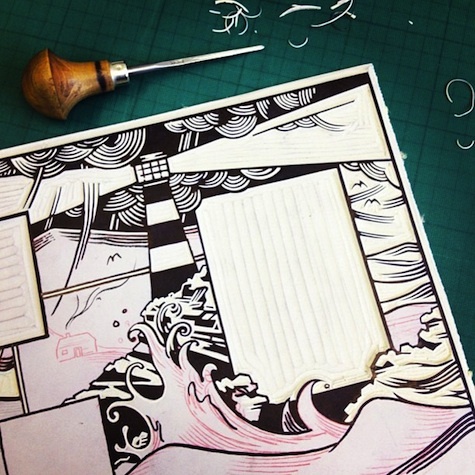 This is the new linocut illustration I’m working on for French clothing company Aigle. They wanted an illustration in the same style as my book cover for Faber and Faber, but with a lighthouse and a stag. This one will go on the inside cover of the lookbooks for their winter 2013 collection. 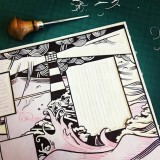 As with most of my linocuts it’s taking me longer to carve than expected and is becoming more detailed as it goes on! thats a great looking lino. Will this be going on Etsy? No, sorry. This was a commission so I'd feel a bit funny about selling it. Not until after it's been published anyway! « Linocut, Linolschnitt, ЛИНОГРАВЮРА, gravure sur linoléum.